September is too fast approaching and kids, teens and others will be returning to school or college. I remember the mixture of anticipation and dread of that first day back after two months of freedom. Back in the grey ages I could smell the pencils, paper and print from the books – it’s a miracle I didn’t get high. I wondered who would be my teacher(s) and who would be in my class(es). Not all was smooth sailing for someone who was shy and quiet (then, not now. Try shutting me up today). 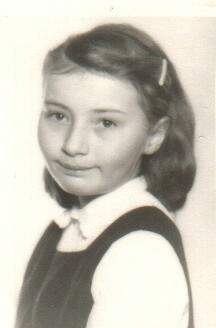 As I write in my memoir, I had some difficulties with one particular nun in grade 2. But that was back then. Now, with this September lurking near, it might be a good idea to focus on renewing ourselves, what we do, and what we really don’t have to do. Some of us are in a too relaxed mode and September can thrust us in overwhelm and overload. Here are a few ideas to help get us through the next month or so (Do as I write, not necessarily as I will do). 1. Make a list of what you do, what you think you have to do in both work and personal. 2. Use the three D’s – delay, delegate, delete as you scrutinize all the items in your “to-do” list. Ask yourself: What can you get someone else to do? What can you put off doing until another time? What can you delete or never do? 3. Tell yourself that the biggest word in your dictionary is NO. Repeat it to yourself, out loud. And keep it in mind when someone asks you to do something you really don’t have time to do. All it takes is a “No, sorry, but I have a full schedule and really don’t have the time to do…” And courage to say it. If I had more courage here I might have said, “no,” back in July to phoning member of my graduation high school class for the reunion coming up in October. But I had to get the list of classmates with their possible current contact info. I’m not a journalist with a nosy mind for nothing. 4. Find some relax time – go and sit in your garden, a park, go for a walk, meditate, listen to soothing music, read a book, heck even watch some of the new TV shows. I think my friend, Fran, had the best way of summing this up – consider what is best for you right now, not what someone else thinks you should be doing. I tend to agree with her. What about you? I’d like comments on how you plan to deal with the September rush and its back-to-business mode. Only Child's home sweet home and garden from the front. You know the saying about holidays, “It’s good to get away but it is always nice to come home.” That seems to describe me when I go away for a holiday the last few years. I can make it for about a week and then I get homesick, not for the routine as one of my cousins suggested, but for my garden and house. Somehow seeing the homes and gardens of the many cousins I stayed with, gives me ideas; my mind follows that train of thought and you can get the picture here. It didn’t used to be like this. When my son was growing up we flew to the east coast and west coast of Canada visiting friends and family. Often we were away for two or three weeks. I don’t recall becoming homesick although I do remember worrying about some fruit I forgot to put in the compost which was left to rot in the fridge. Well, some grapes left in the fridge this time round grew some white mold. 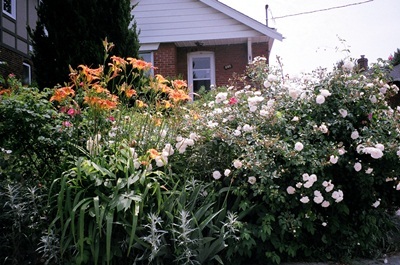 But I had my friends next door checking the house and garden, watering plants, bringing in the little print mail I get, so when away I didn’t worry about the house and garden. I just missed them. However, I needed this holiday away from work and dealing with the myriad of stuff requiring fixing, purging, etc. at my place. Therein is the crux for anyone working from home: sometimes you need to get away from it all wherever you chose as your destination (or in my case, five different destinations). While away I wrote nothing but personal email replies and edited nothing. In fact, I was so out of the writing/editing/loop that one of my Michigan cousins (a retired circuit judge) found a spelling inconsistency in road signs and pointed it out to me. But I took photos of cousins, friends and gardens and showed my garden and previous holiday photos to my cousins and friend, thanks to a memory stick. Upon my return I went into a house sorting, gardening and then marketing (editing) frenzy, plus sorting out the business email (unlike some people I know, I don’t deal with business – online or by phone when on holidays and let my clients know beforehand.) That’s another key – don’t take the business with you, unless you are on a business trip. In this technology-based society, we forget to take breaks. Take my two seat companions on the train to Strathroy, Ontario. No. 1 was a young male plugged into his Ipod until he got off one stop after the trip’s beginning. The young lady who next sat beside me began with her laptop, then moved to her e-reader and finally as the train rolled into London, Ontario, her Iphone. Except for the e-reader, where’s the relaxation in all that? So, my only regret is I didn’t get my third train ride, the one home from Grimsby, Ontario. The train, coming from Albany, NY, got stuck for hours in Rochester. So VIA Rail arranged for a cab to pick up those of use coming from St. Catharines and Grimsby at the railway stations at train time. Good move for the six of us going to Toronto Union Station. The taxi (a big van) ride was smooth and we arrived about the same time as the train would have. And I didn’t have to lug my bag and laptop up the steep train steps and try to make it along the narrow aisles without having my bag’s strap latch onto the back of the seat. So, I tell myself. But, hey. I’m the daughter of a railway man and train travel is in my blood. Now, I’m getting serious about taking the train to the east coast and west coast of Canada. Not this year. Now I have bills to pay, have to put food on the table, and there are house and yard repairs. (the hose sprung a big leak and needs replacing). Where do you go to get away from it all? Do you go away? And do you keep yourself plugged in 24/7 like you do when at home and at work? Only Child's home and garden respite - part of the "bucket list" already done. One of my cousins has a bucket list – you know a list of things you want to do before you die. Up to now I haven’t really given it much thought. My parents died in their sixties and I’m getting very close to the age when my mom died. And when you are busy dealing with the daily crap coming your way, it almost seems redundant to consider a bucket list. But my cousin has got me thinking. I have a bucket list, for want of a better word, for my writing, but it doesn’t go beyond a year. I think I’m afraid to think beyond that because it might throw a curse on it. Looking at her and other cousins’ travel photos, I started asking myself – where would I like to travel? I’ve been across Canada both ways and the only provinces I haven’t seen are Saskatchewan and Newfoundland; I also haven’t been to any of the three territories. I would like to go to Newfoundland and Nunavit Territory (both preferably in summer). I’ve also been to England and Wales. And I like to ride on the train. I’d also like to return to the other Maritime provinces – a grade school friend is travelling in his RV to the Maritimes and I read his blog and I think I would like to go back there. You can take a train into the Maritime provinces. You can also take a train out west – takes a few days but the scenery and the experience would be more interesting than a five-hour plane ride where you look down and maybe see toy-sized buildings if the clouds don’t get in the way. That is some of what I would like to do. I know I don’t want to jump from a parachute or go bungie jumping but I’d like to ride in a helicopter, even though I chickened out 15 years ago. I don’t want to go canoeing, camping, but maybe I’d like to go fishing. Perhaps the clue here is to brainstorm for a so-called bucket list and then prune it down. As for “scheduling” when I would do what – that would depend on time and money. Right now I just don’t have the money to travel a lot beyond southwestern Ontario to visit my cousins (but I get my train ride and some interesting visits with my family). And there is my house and garden, something on the “bucket list” already achieved. 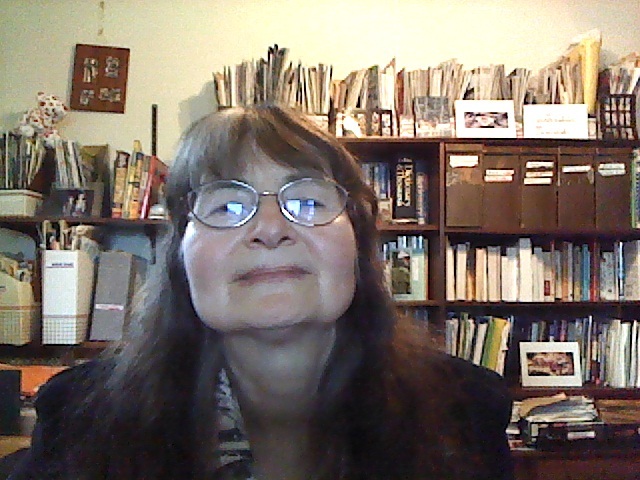 I’m living where I want to in my retirement home, a small bungalow and have slowly cultivated my garden of perennials, vegetables, fruit and herbs. 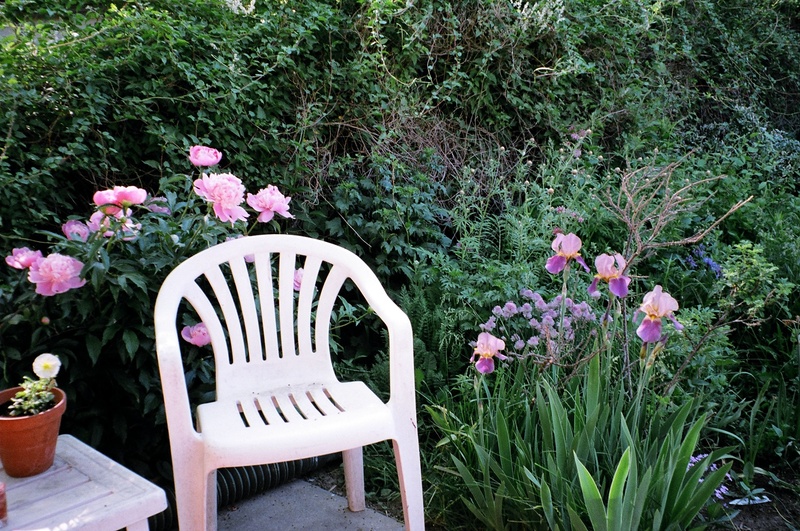 The garden also provides a serene place to sit and read or just enjoy the flowers, butterflies and birds. And maybe that is part of the answer. Try to take each day as it comes. If you plan too far into the future you can get screwed. Only Child in front of some of her books, obviously some she bought, not borrowed. There’s been much hoopla about Toronto’s mayor and his executive committee wanting to cut Toronto Public Library services, like closing branches. I’ll cover that in another post. But it’s made me think. Why do we read? Why do I read? I’ve been a book-lover and reader since I learned to read in grade one (back in the grey ages, of course) – from the Bobbsey Twins books and Nancy Drew books my mother bought me to when I discovered the library – the then brand new S. Walter Stewart Branch and began to visit it frequently, borrowed books and read them. Since then, thanks to the library, I’ve increased my unwritten list of authors. Most of what I read is mystery novels, memoir and some non-fiction best-sellers that could be loosely described as dealing with today’s social conditions. “The Tipping Point” by Malcolm Gladwell is one example. This latter category I read to be informed, but the two m’s, I read for the enjoyment, to get out of my life, to escape from the crap continually shoved my way. True, the people in both types of books have their problems and conflicts, but they are THEIR problems and conflicts, not mine. I can get out of my sometimes miasma of living and get caught up in someone else’s life whether fiction (the mysteries) or real (memoir). Unlike life, often a solution to the character’s problems is found. Even when it isn’t, I still can take comfort in knowing I’m reading it, not living it. And sometimes I can find a solution to what ails me in my often ridiculous life, although that is usually from the non-fiction social conditions books. When reading a book that grabs my interest, I do get tangled in the various characters’ lives and can love, hate, emphasize and even think, “that character needs some come uppance,” and know that a good author will have this happen. Real life can be a different matter. Sometimes I believe what goes around comes around, but not seeing it happen can raise doubts. Not in a well-written book – you see it all happen. When you have to put the book down, or shut down the e-reader, to get on with your life, the book’s characters stay with you and you can’t wait to get back to them. When you’ve finished reading the book, you get that feeling of closure, that things have been sorted out (usually – a few leave you hanging which I don’t like) . In real life, often the same crap keeps happening no matter what you do and it can all be very worrying. Reading a book – print or e-book – can take you out of yourself and your misery if only for awhile. My cousin buried her mind and soul into reading novels when her husband was dying. But if you have money problems, health problems, even time problems, reading a good book can help ease the pain. And the public library branches have so much to choose from. And it’s free with a library card…as long as you return the book on time. Why do you read books (print or e-books)? I’d like to know.